Anawana Haloba’s artistic practice is an ongoing investigation process into positions of different societies within varied political, social, economic and cultural contexts, ideological and post-independence frameworks. Her artistic practice is symbiotically linked to and through her preparatory exercise in drafting poetry in the forms of sketches from which the artist abstracts to performative based artworks within moving image, installation, and sound, while creating situations where the material culture of any given place can be probed and reconsidered within the scheme of rapidly shifting contemporary subjectivities. 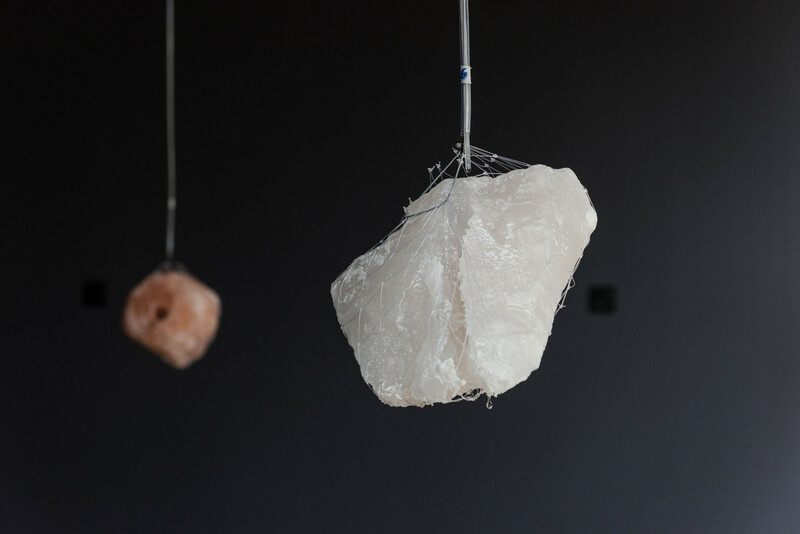 For the 32nd Bienal, Haloba presents Close-Up (2016), an installation with sound elements revolving around salt rocks that, over a period of time, undergo a process of liquefaction. Close-Up makes reference to the bodily fluids of humans, minerals found in landscapes and the historical significance of salt as a means of exchange. The melting and trickling of the salt is a slow, timed, and amplified process that ultimately leads to relief on the one hand and extinction on the other.